The global advertising market will grow at decent rate in the next few years despite the uncertainty created by the UK Brexit vote and US election result. Media agency ZenithOptimedia made the bullish forecasts today. “We forecast global advertising expenditure to grow 4.4% in 2017, the same rate as we estimate for 2016,” it said. 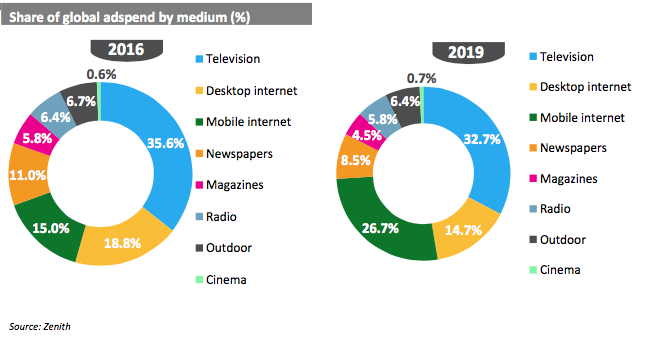 By medium, TV will still command the largest portion of the ad pie this year with a 35.6% share, ahead of desktop and mobile internet, which took a combined 33.8%. By 2019 the tables will turn, however, with mobile (26.7%) and desktop (14.7%) internet together taking a greater share than TV, which will account for 32.7% of the market. Despite the wider resilience in the face of Brexit, the UK’s decision to leave the European Union is having an impact in the country. Having been performing strongly beforehand, the Brexit vote will slow down growth. Zenith has downgraded its forecasts for the UK, although it remains in positive territory with growth of 3-4% expected between 2017-2019. In Eastern Europe, meanwhile, Russia, Ukraine and Belarus are all suffering ad downturns because of sanctions, the Ukraine conflict and the fall in oil prices. The list of top ten advertising territories by expenditure will remain settled between now and 2019 with one exception – Indonesia will replace Canada as the tenth-largest market.